The flagship of the Shromet Corporation. A futuristic interpretation of the American Muscle car that always blended the lines between GT and Muscle car. It was the genesis of the company, and remains its flagship to this day. So what went wrong? From day one, Shromet was always dead set on chasing the future, and they quickly caught onto the growing trend of imports in the American market. And what did most imports have in common? Front Wheel Drive. Why not, thought the brilliant minds of the Shromet Engineers, transform the dragon into the first of what will be an inevitable trend? Where all cars use the transverse layout. Combine this with an already ancient engine design from the early 60s, a 5.4 Liter Pushrod V8. Even with sequential fuel injection, emission regulations strangled it, and it couldn’t even manage more than 240 horsepower. Sure, as a regular car it wasn’t that bad by 80s standards. It could even manage to get from 0-60 in 5.6 Seconds. But as far as dynamic handing is concerned, despite independent rear suspension, it was a front heavy understeery mess. In the early 80’s, North American Motors saw the craze over the new Group B rally series and the potential for lots of exposure. 3 years of intense design and engineering led to the creation of the 4x4000 (Four by Four-Thousand). Riding on a steel space frame with fiberglass panels, double wishbones up front with coil spring solid axle in the back, it wasn’t terribly agile, but it was rugged. Power was provided by 2.0 liter OHV I6 Turbo driving a 5 speed manual transmission with a 4WD transfer case and LSD front and rear differentials. With throttle body injection it could only muster a pathetic 310 hp. The curb weight of 3,100 lbs only further destroyed any racing potential. A 0-60 time of 6.6 seconds was quite quick for a street car, but for a Group B supercar, it was below subpar. By the end of 1986 and the dissolution of Group B, the 4x4000 had no podium finishes. All 221 examples were scrapped. I love it! Keep 'em coming! 80s is the greatest decade of them all. Case in point (II): The Hermes Supercontinental. 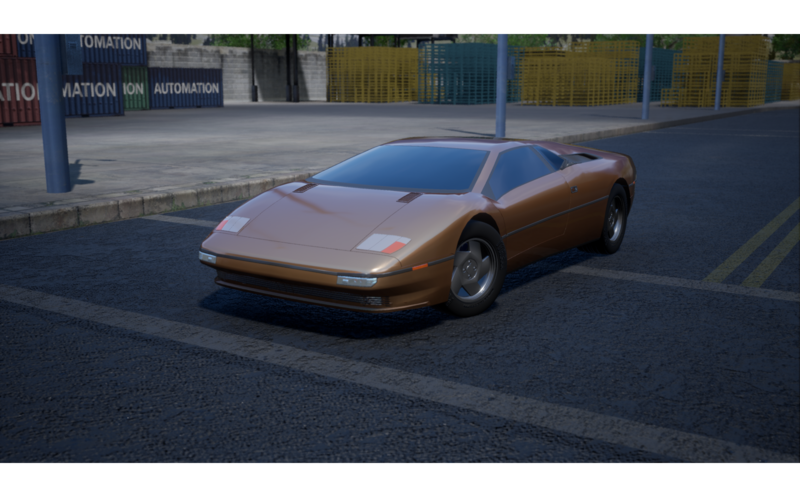 Another failed Supercar from the (late) 80s however a lot more competent than that french monstrosity from earlier. 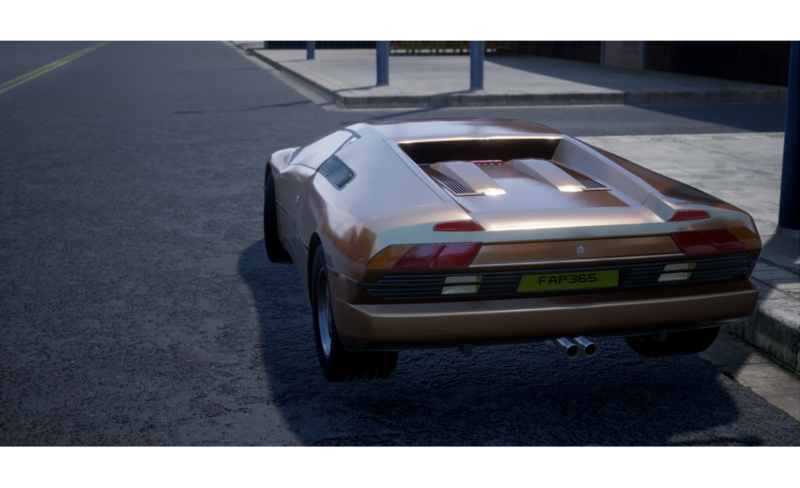 Slick, aerodynamically optimised and with a delightfully simple 6.4L SOHC V8 loosely inspired by the Mercedes Benz M100. The Supercontinental was an absurdly robust vehicle, made entirely from thick steel, meaning it weighed near enough 1.7 metric tons, but then again arguably one of the safer cars from its era. It certainly wasn’t winning any drag races. The massive V8 was equipped with a catalytic converter to comply with US emission regulations and produced its 340hp peak power at just 5100rpm. Acceleration was not its strong point, even less so when equipped with the optional 3-speed GM THM425 automatic transaxle (also found in the Cadillac Eldorado and GMC Motorhomes of the 1970s). But raw grunt and a reasonably slippery body saw the vehicle reach upwards of 180mph regardless. Everything pointed toward this being a winner, it had just went through US type approval when the company went bankrupt. All 44 surviving prototypes and pre-production cars were fully road legal and registered, and a few have racked up surprisingly high mileages given they were fully bespoke vehicles sharing almost no parts with mainstream models apart from the automatic transmission. In retrospect this tank was a bit too boring to be truly desirable, the world wasn’t ready yet for a useable supercar. And they were all beige. Beige is the best colour for a supercar. Beige is the best color for any car. As long as it’s a medium beige, then it keeps the dirt from showing as badly. Introduced in 1985, the Genra G2A Turbo Coupe was intended to be the company’s entry into the burgeoning sport compact market. Despite only developing 160 horsepower, its 2.0L turbocharged I4 put out a sizable amount of torque considering its modest displacement, while its independent rear suspension made it feel agile and light-footed in the corners. Four-wheel disc brakes provided ample stopping power with minimal fade, while a five-speed manual gearbox and viscous LSD allowed the driver to put the engine’s wide powerband to good use in any situation. Keep in mind that this car weighed less than one metric ton. 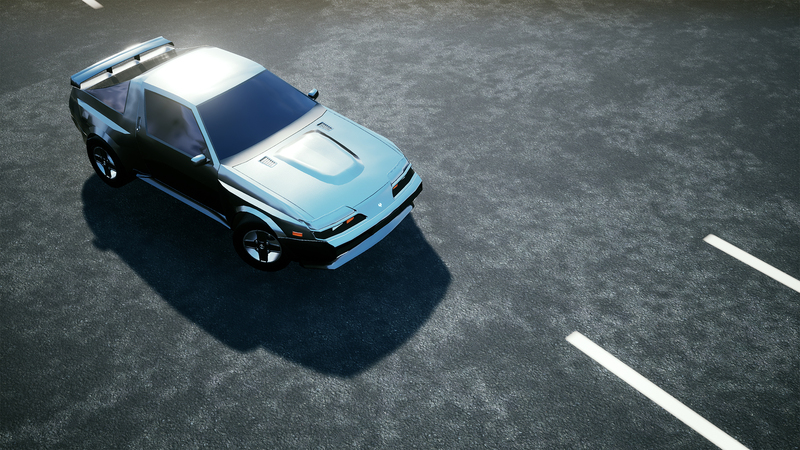 That might explain why it felt surprisingly fast… For its time. And given that it was built on such a sound basis, it should be no surprise that it received a lot of aftermarket support - and still does to this day. Maxon Performance Divison built the Phoenix GT350 under the philosophy of “more is more”. More power, more aggression, more v e n t s. Nearly five years were spent turning their small GS2 sports car into this monster. What did the Phoenix revive you ask? Nothing really, the marketing team just thought it sounded cool. It takes some effort to line up the rims for pictures. The GT350 title comes from the powerful 4.0L MV8’s power output of 332hp (eh, close enough). The engineers quickly realized this was way to much power for the GS2 chassis, so they converted the drivetrain to an AWD manual 5 - speed and called it a day. 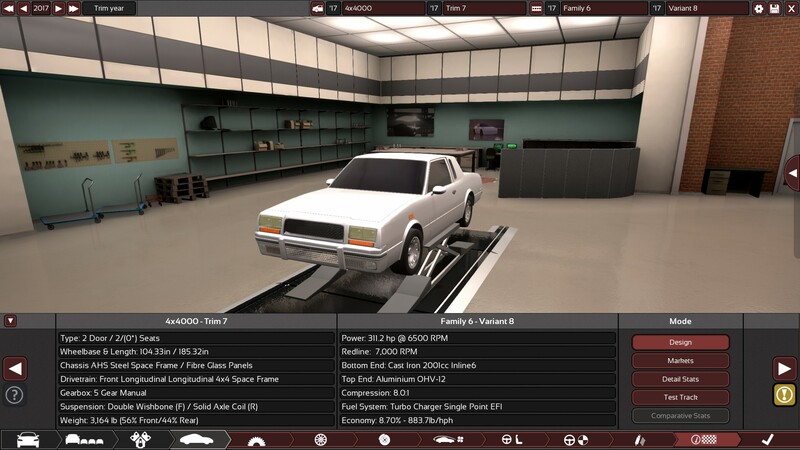 Despite the big engine and upgraded interior, the car was still relatively light and weighed 2,683lbs. Much to Maxon’s surprise, the Phoenix was actually somewhat easy to drive if you overlook the constant oversteering and uncomfortable ride. The Phoenix was a solid straight line performer, going 0-60 mph in 4.6 seconds and doing the 1/4 mile in just a hair over 13 seconds. 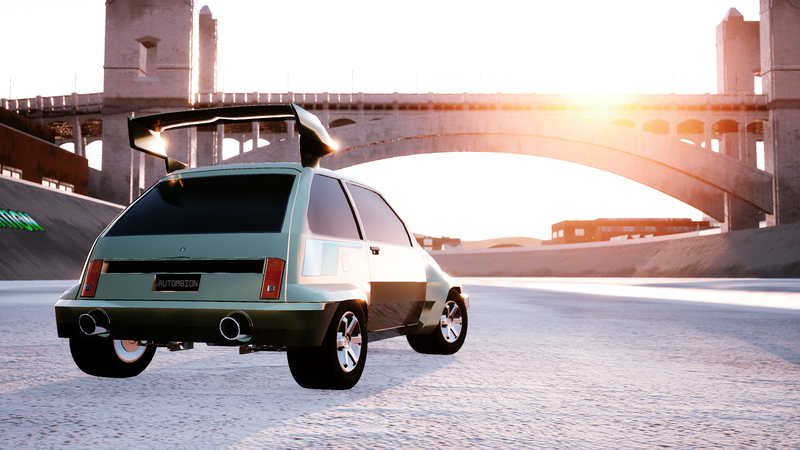 Maxon put an absurd amount of effort into shaping the body to allow the car go a higher top speed. Turns out, all of the spoilers and vents kept the car at 154 mph. That’s still faster than anyone had any business going on the road, but it wasn’t good enough. Maxon needed more. The people need more. Rule of thirds, dynamic triangular composition, focal point. The Phoenix GT350 only lasted 2 years. The nature of the Phoenix brought out the worst in drivers and became the center of a some high profile accidents in 1985. Due to the bad publicity as well as the fact they were losing $ 3,000 with each car sold, production ended after just 1,255 examples were made. 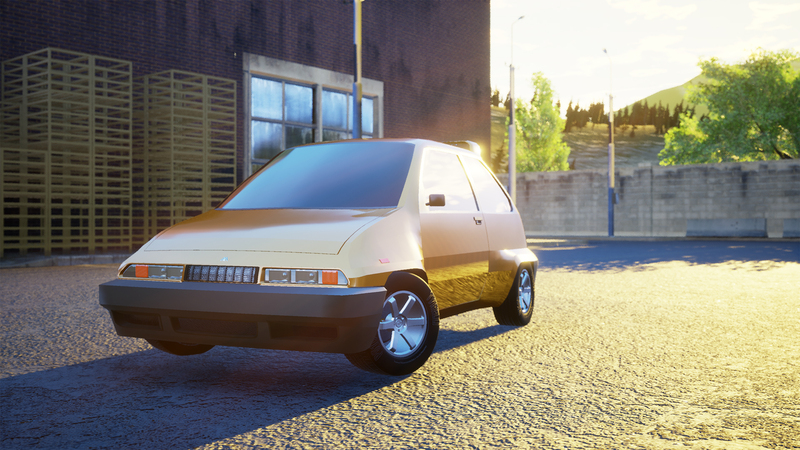 Maxon wouldn’t make another high-powered sports car again until 1996. And your photos are fantastic! Pegasus was a loss leader for Olympus Motor Group, featuring simple inexpensive automobiles such as the Courrier. From 1953 until 1980, the Courrier remained unchanged, other than mandated by federal regulations (padded dashboards in 1961, 3 point front seat safety harnesses in 1967, rear seat belts, etc.). The car relied on a 60 HP 1.3 Liter 4 cylinder that it shared with other Pegasus vehicles. 1980 noted a radical departure for the Courrier however, as Pegasus engineers turned it sideways and mated it to, the first for this brand, Front Wheel Drive. Many competitors had been converting to FWD over the last decade (and many would continue for the next decade). With this ‘innovation’, the Courrier got a new, distinctly 80s redesign (one that would not likely carry over the next 27 years). 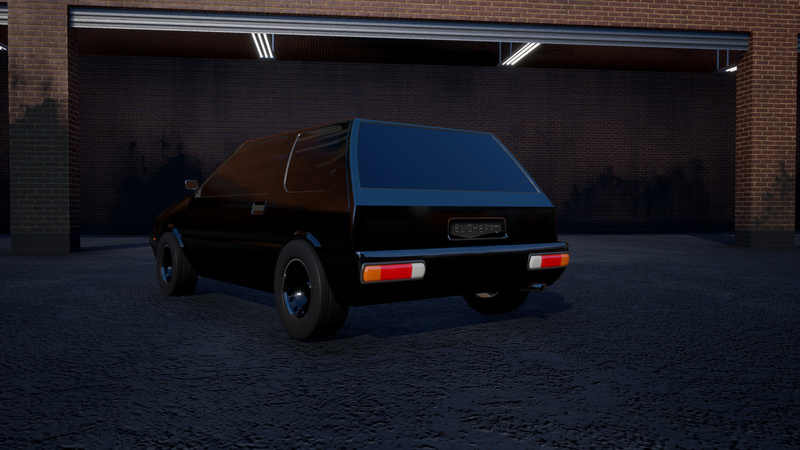 Looks exactly like the kind of cheap, uninspiring hatchback that we came to love (and hate) throughout the 80’s! Thanks. I was actually going for that this time. I’m surprised more people don’t remember the single mirrors from that time. I do. My Dad’s car growing up had just a driver’s mirror. It was the base model. Funny enough, the “luxury” model of the exact same car, exact same year, was my 2nd car. It had both a driver and passenger’s mirror, power no less! Marrow Motor Company was hitting its stride in the 80’s producing cheap boxes in various shapes and sizes. In an effort to become more globally known, Marrow began work on cars that could compete in motorsports. In 1987, the HGH SE was born. 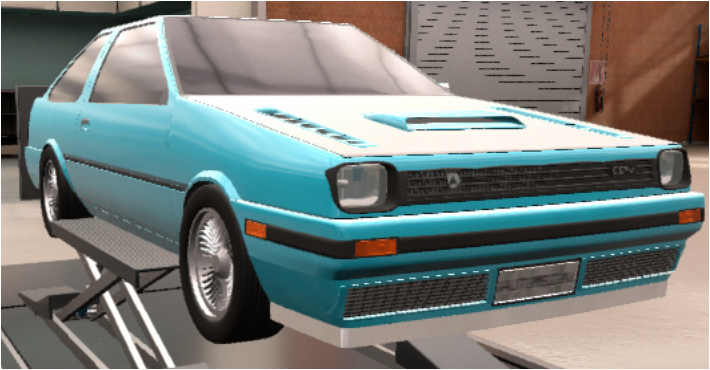 The HGH SE was essentially Marrow’s base hatchback on the outside, with only new rims and a spoiler to give it some identity. While radically toned down from its racing counterpart, the HGH SE was still quick for its size. The 1.4L inline 4 engine cranked out 80.2 hp which propelled the little box from 0-60 mph in 9.66 seconds up to a top speed of wait for it…wait for it…95.6 mph!!! The extremely light 1709 lb weight meant that if you were particularly swole, you didn’t need another car to pull you out of the snow when you got stuck. 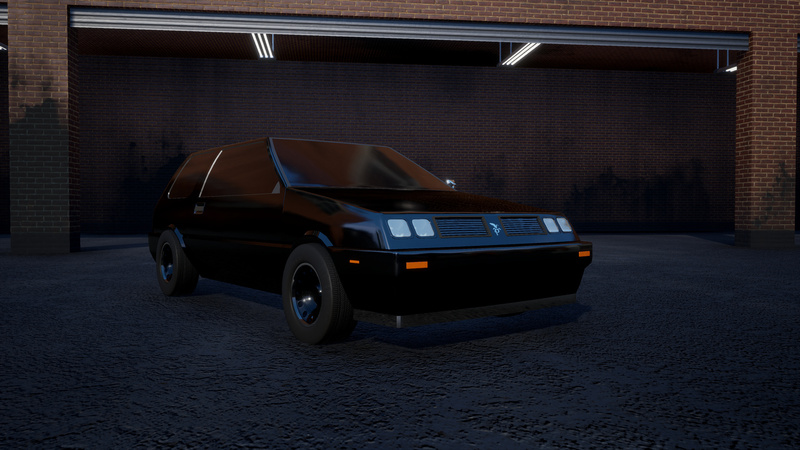 Before Marrow released the SE, they experimented with a more faithful road version of their new racing machine. 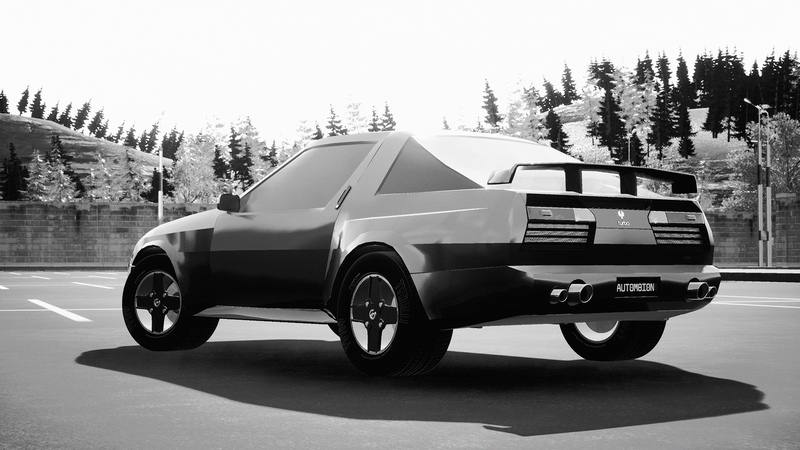 Three HGH prototypes were produced with the last being fully driveable despite the lack of mirrors and safety features. The small twinturbo V6 more than doubled the output of the production model at 168 hp. It was also outfitted with a new AWD 5-speed transmission and extremely wide tires. 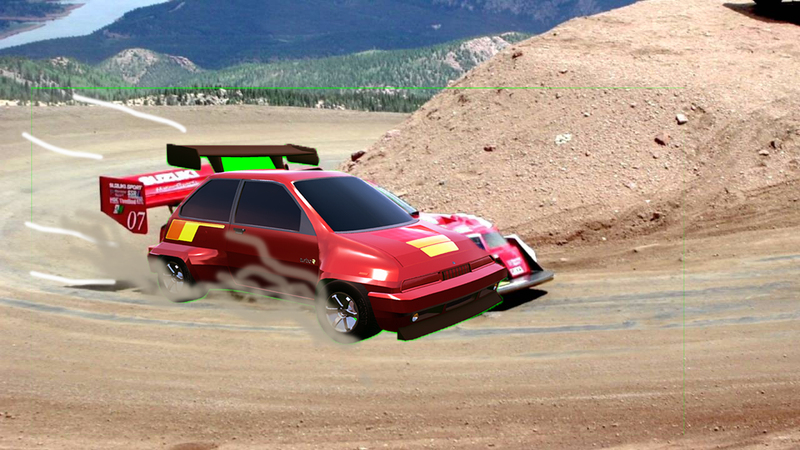 Marrow’s new race car went where all radical-winged boxes go, the Pikes Peak Hillclimb. 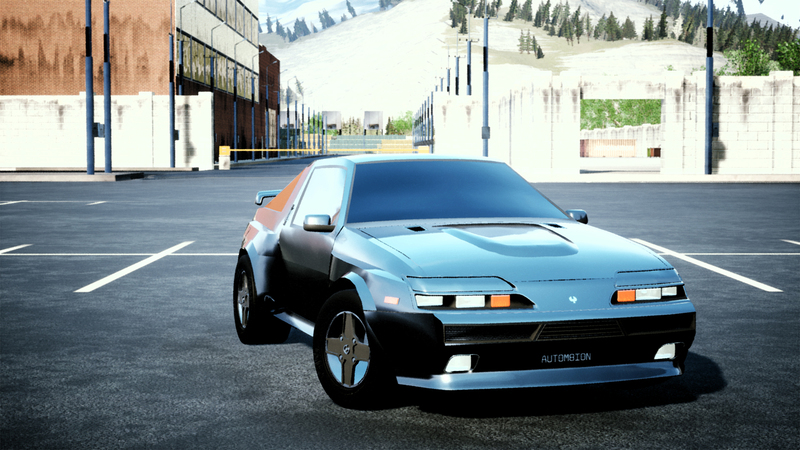 With 370 hp packed into it’s small body, it was a force to be reckoned with. Marrow Motorsport felt they have perfected the art of the rally machine. How did it perform? Terribly. That 300+ horsepower only lasted for about 1500 rpm. The rest of the time it was wheezing out 40 - 80 hp. It was as aerodynamic as a vertical brick. The suspension was low and tight, too tight for the gravel and dirt that made up the course at the time. After the crushing failure, Marrow shifted it’s focus to road racing. (To my surprise, it is actually about as fast as a 2014 Porsche Turbo S on the paved Pikes Peak). Oh it was a joke . I’m actually a digital arts student, I just didn’t feel like spending any amount of time on it.